Can't say anything bad about this ball. I'm very impressed! Rolls very smooth and continues through the pocket. I kept this ball the same right out of the box. Most of the time I will hit a ball with an abralon pad just to get the factory shine off the ball. Usually with 3000 or 4000....BUT I was very impressed with it to say the least right out of the box! This ball is going to be a benchmark ball for me indeed! If you try it, you will like it. The way the ball rolls and continues to roll without losing energy is simple amazing. No matter where you stand or how you throw the ball, it gets to the pins. Everyone should own this ball. Here is my review of the Space Time Continuum. I drilled the 15lb version 70 x 4 ½ x 50. Due to my higher than average ball speed, I prepped the surface the same way I do with ALL my pearl balls, fresh 2500 grit pad followed by a used wet 4000 pad at high speed, giving me SHEEN and good length with no compound. I believe the changes that they made to the core numbers and the cover in this pearl asym are definitely great. I find this ball to be very friendly and continuous on a number of patterns, it gives me good length with a visible, effective read in the midlane without the core locking up and diving left. I was even able to play in front of the ball return with it recently at an event with a 43-foot sport pattern with a great look and great carry. If you take the rev rate down a notch and let it roll you can also “Norm Duke” it up second arrow or wherever the oil line is on your house shot. One thing I rely on on every shot is continuation and the continuation and friendly shape this asym makes is excellent. I would recommend this to anyone as it seems very driller and user friendly. If you’re looking for a hard hitting pearl asym that will give you some forgiveness this is definitely a great ball to buy. is great for any style, it will conserve energy for more power at the pins. Your favorite layout should work fine. I personally like to play this ball down and end to take advantage of the big move at the back end. 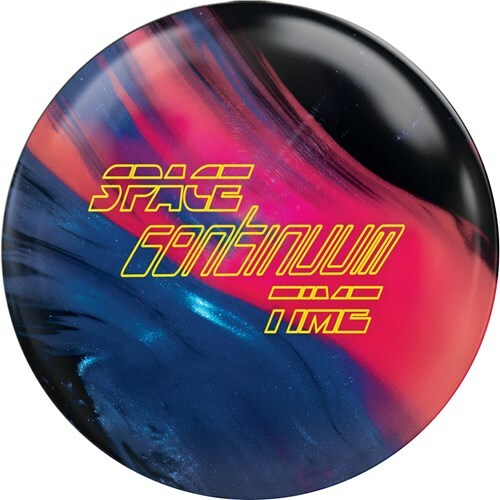 My ball speed is about 16mph so medium conditions work best for me with the Space Time Continuum. It’s also great when the lanes are spotty or other bowlers on your pair are playing different areas on the lane. Everyone needs a ball like this. Page created in 0.647 seconds with 23 queries.